This was the first grown-up game that I was able to get my youngest daughter, Anna, to enjoy. She was only 6 years old and had some trouble keeping track of the destinations. We made two modifications that really made her fall in love with the game. 1) Open destinations. Keep the destination cards face up. Anna had a hard enough time keeping track of her multi-colored train cards, let alone the destination cards. Keeping them face up in front of her made it easier. 2) Use colored markers on the map to indicate each player’s destinations. This really helped my daughter go beyond the typical linearity of most kid strategies and consider a network instead. I would also urge any parent using this variant to avoid exploiting a blocking strategy until your kid figures it out for themselves. Fewer tears that way. What’s a linchpin? It’s the most important route in your plan. After deciding which destinations you want to connect together, you’ll probably find that there’s one spot where you NEED a particular route in order to avoid a huge detour around the map. Now, most people tend to get route after route in order, slowly building their strip of trains as they go, but it’s more important to figure out where the ‘hot spots’ on the board are, and grab them early! For example, the connection between New Orleans and Houston is a very popular one, so I’d grab it early. Another important route is Las Vegas, which only has two routes connecting to it. Finally, be sure not to get cut out of Alaska. You’ll really see this in the digital format, because if you don’t grab them first the bots will. There are two routes that you should try to get on your first or second turn if you think you are going to need them. Houston to New Orleans: If you need to get across the map east to west on the south end this route is very important. Failure to grab this route could cause you is spending at least two more turns to get around and reroute. Nashville to Atlanta: To me this is one of the most important routes on the board even though it is only one space. It can easily be used to connect routes that are both east and west as well as many of the routes that travel along the east coast. It is also nice because it will link better to longer routes yielding more points verses two spaced routes. I’ve played dozens of games of Ticket to Ride and I have observed that choosing routes wisely in the first round is critical to winning the game. – Always choose routes that are grouped together, so it doesn’t take many turns to complete all of your routes. – Try to choose routes that will form into the longest route possible (The ten points are critical at the end). – Try to choose as one of your first two routes, a cross-country route. This will make it easier to add new routes on without much effort. – Try to avoid routes with critical choke points (2-3 trains long) that fill up early. A corollary to the Annoy opponents tip. If your routes take you near key block areas like Nashville to Atlanta or LA to Pheonix, get your trains on it ASAP. You don’t want to get blocked and stuck with a longer route or break up a potential longest route. Those areas take few cards, so you can get them early and not give away your route too early. Every T2R board has Key Cities. These are cities that either serve as a major hub or crossroads geographically, or that appear a little more often than others on that game’s Destination Tickets (the two are usually related). Choose your opening routes to allow yourself to cross thru 3-5 of those Key Cities and finish a long, continuous path (helping win the Bonus Pts, too, if your game is using that card/rule). Then, if you’ve “played your cards right” (snicker), you’ll be in a position, with plenty of time/turns left, to draw aLOT more Destination Tickets (maybe baffling your opponents). It is very likely that with each draw you will have already completed at least one of those routes = free points! Even if you have to “swallow” a loss of points once/twice, you’ll more than make up the difference in longer, already connected, routes! Figuring out what the Key Cities on each map isn’t difficult, just takes some observation and repeated play. And, HEY! That’s what we’re all here for, right? The loudest groans I have heard while playing Ticket to Ride don’t come from someone taking a needed route, or drawing a bad set of tickets. Instead, these follow after drawing new tickets, spending the time to analyze one’s hand of cards and the board, and deciding on a plan. A turn or two later, the player realizes they don’t have enough trains left to complete the routes they need. Make sure to include the number of available trains you have left when planning your final routes. Also keep in mind the alternative routes’ length (if any) in case someone grabs the most direct link you were planning on using. 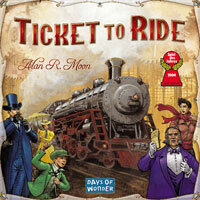 Running out of trains early may not cause you to lose, but it will sour your gaming experience. Usually when you get your initial destination tickets, most people pick the most optimal path. Don’t just pick one path, but see multiple routes that complete all your destinations. This gives you back-up plans should either someone block you or the cards aren’t going your way. When we play with our children we allow the trading of train cars. We only allow 1 for 1 with the exception of wild cards and they can be traded 2 for 1. The kids love this aspect as it makes them feel more in control of the game. While the normal game states that all players start with 4 train cards, a way to get the ball rolling faster is this little variant. Instead of dealing out 4 cards, all players get 7 cards as their starting hand. This will give players more starting resources to start forming their plans. Additionally, after the drawing of destination cards, you can allow the players to use the first full round to draw from the draw pile only (no playing routes or drawing more destination cards). This can be helpful in both the base game as well as the 1910 expansion. One strategy I really enjoy using is hoarding a particular color. Early in a game I will pick a particular color that I don’t need and pick it up whenever there is not something I need. I then sit on this color for as long as I can then use them for the gray (any color) routes towards the end. This causes problems for other players that might desperately need more of that color, but since you can still use them for the gray routes it doesn’t really hurt you. It is important to not let this strategy get in the way of getting cards you need, though.